Getting a Mexican drivers’ license was easy. In fact, on my list of “what are the hardest things I have done in my life” it rates just below deciding to have another bowl of ice cream last night and just above rooting for the Eagles over the Patriots in last year’s Super Bowl. Considering that getting a Mexican DL requires dealing with Mexican bureaucracy, you could say that I was shocked - shocked! - at how easy was the process. The country can’t figure out how to pipe potable water into people’s homes, but can process a drivers’ license application in the middle of a Friday afternoon in less than an hour. Amazing. To boost people’s perception of Mexico, and in case you want your own little plastic card with your picture on it and all the words written in Spanish, I thought I would describe the process. First of all, the reason I needed a Mexican DL is because we recently purchased a car to drive around town. As we anticipated, Wesley, our VW camper van, is not suited for steep hills, narrow streets, and parallel parking in a space the size of a bankers box. 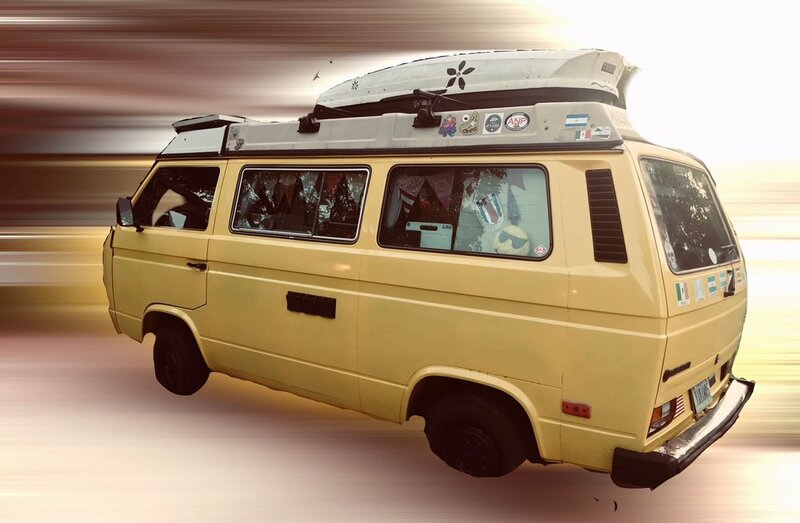 The VW Westphalia is a flashy - if not practical - car for climbing the hills and navigating the alleys of San Miguel de Allende. The Honda Fit is a practical - if not flashy - car for climbing the hills and navigating the alleys of San Miguel de Allende. Signatures are very iimportant in Mexico. They often have to match identically from document to document. If you sign with your middle name on one document, don’t sign with your middle initial on the second. It can set the entire process back to start. Before putting my signature on anything I ask how it should be signed. It seems silly, but it can save much teeth gnashing. Well, this is pretty much what we expected - we thought - to be stymied. A friend told us she had to go to vehicle registration four times before she could get her new plates. For some reason which she hasn’t explained, she brought her kitten with her on the final trip and the guard (who knew her by this time) took care of it while Lori dealt with the official at the desk. Mexico has a very strict 'no kittens at the counter’ policy. The staff doesn’t want to be influenced by cuteness. Anyway, after explaining our problem to the security guard, he informed us that we could bring our landlord to the office and she could attest to where we lived. Bringing Joyce to the office wasn’t a good option. The other option the guard put on the table was getting a Mexican DL. That ID would have the address on it, and we could then use that as both a proof of ID (in lieu of US passport) and proof of residency to get our vehicle registered. The guard also suggested coming back on Monday since it was mid-afternoon on Friday and there were many people in line ahead of us. We are thinking of putting him on our Christmas card list this year. There was a clinic next to the DL office where I could get an exam - I’ll get to that in a moment. But, regardless of whether I was able to get an exam, it would seem that we were in the same bind with the proof of residency - we didn’t have a utility bill with our name on it. This does not matter for getting a DL. All we needed was a utility bill with the address on it that we wanted put on the DL. It didn’t matter that Joyce’s name was on the bill and that I was not her. I could have said I lived on Sesame Street if I could have gotten an electric bill from Bert. With the tricky residency issue resolved, I turned my attention to satisfying the next item on the list - a medical exam. The clinic was a storefront with a man sitting behind a large counter. The room was painted white - the official color of clinics. There was no one else in the place. Rebecca: He needs a medical exam to get his drivers’ license. Man behind the counter (doctor?) - Does he know his blood type? Man behind the counter: Do you have seizures? Man behind the counter: Do you have diabetes? Man behind the counter: Does he have high blood pressure? Man behind the counter: Any prosthetic limbs? Man behind the counter: Has he ever lost an arm or a leg? Man behind the counter: That will be 100 pesos. Please take a seat while I print his report. Moments later, I had my medical exam in hand reporting a clean bill of health. Now all I needed were copies of all the documents. Here I am moments after receiving my medical report. If you can read the small print, it says I am healthy enough to drive. Conveniently, as if there is actually a God, a papeleria (a stationary store) that had a copy machine was right next to the health clinic. Eight pesos got me all the copies that I needed - and it was back to the DL office. The hardest question I had to answer when getting my Mexican Driver’s license was whether I wanted a 3-year or 5-year license. 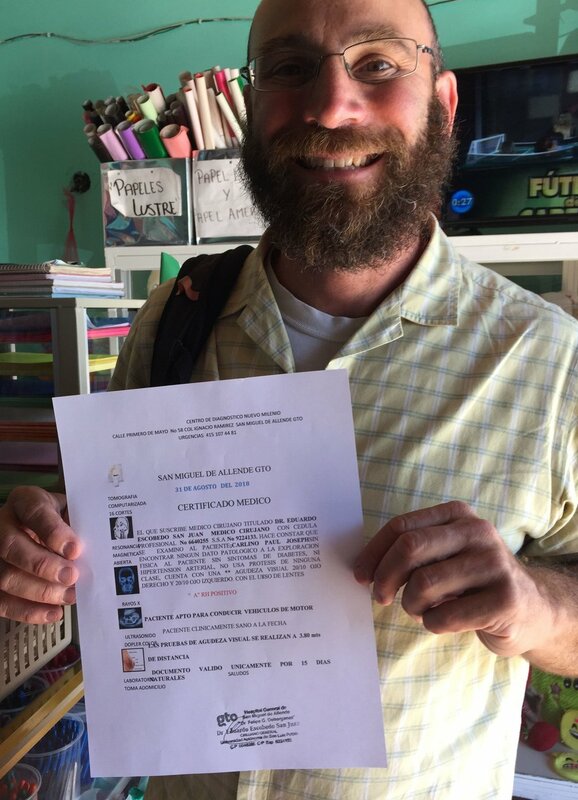 Then I had my picture taken, I paid the 851 pesos (about 45 USD), and was handed my new Mexican DL valid until August 31, 2023. Unbelievably, we were out the door. I was not pulled over by the police on the way home so did not get to show off my new card. We were tenth in line at the registration office on Monday morning. With all of the documents in hand, all we really needed to do was wait our turn. I did my part to move things along by making change for the office of a 500 peso note. Once the guy in front of me was able to get his change, I stood up and went to the counter, answered some basic questions, paid the 1,951 pesos (about 100 USD) and was handed the new plates and registration. In case you are keeping track, the entire DL and registration process, in two separate offices, took less than two hours. And we didn’t even need to bring any kittens. Unfortunately, Mexico public works are not as efficient as the DMV. We called the local water company about a leaky pipe in the street outside our house. 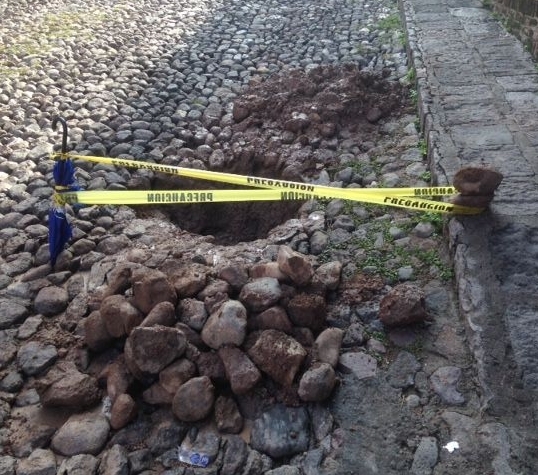 It took two days before a group of four guys with shovels and pick axes showed up and dug this hole in the street. They repaired the leak with tape and wire. After securing the site with an official ‘waterworks’ umbrella and some ‘caution’ tape, the group went to get lunch. They came back a few hours later and threw dirt in the hole but left a pile of rocks on our sidewalk. When the late afternoon rains came, much of the dirt washed away leaving a nice crater.